All tests created from the UI start in a Draft state. This allows you to craft your test in a state where it won’t be accidentally run alongside Published tests or block a Run Group. Once you are ready to set the test live, you can Publish it knowing that your test is accurately written and ready to provide you QA coverage. To set a test to Draft state or to Publish it, use the dropdown on the top right of the test view. A test in a Draft state can be run to receive feedback on the test instructions. Clicking the Run Draft button will unleash expert testers to execute the test and provide feedback on the steps you have written. To view feedback from testers, just click the comment icon at the top of the test view and any comments will show up on the right sidebar. This will show comments from the latest run next to the corresponding step. You can set a Published test to Draft. 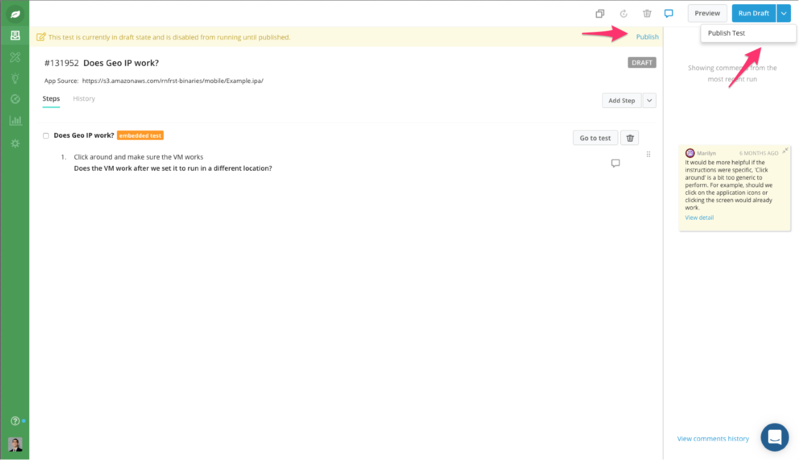 This gives you the ability to update tests and get feedback on revisions before setting the test back to a Published state. You can set a Draft test to Published immediately. If you’d like to bypass running tests in a Draft state, simply click “Publish” at the top of the screen anytime and the test will be live. To view your draft tests, click on Tests side navigation tab and “Draft Tests”. This shows you which tests are still being written or updated so you can focus on your top priorities. You can also see which tests have feedback from testers – just look for the comment icon next to the test title. In the Results side navigation tab, clicking on “Draft Runs” shows you all of the tests that have run as a draft. Non-Draft runs will appear under “Runs”. The draft feature is backwards compatible for CLI and DevX users. New tests uploaded or created via the CLI or API do not start in draft state automatically. To set a test to a Draft state, use the headers # state: draft. For more documentation on the Rainforest CLI, please see our CLI read me.